SIMFEROPOL, February 11. /TASS/. 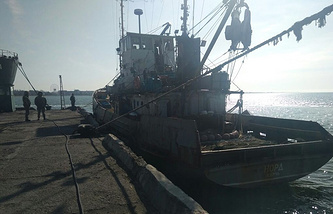 Captain of Russia’s arrested Nord fishing vessel Vladimir Gorbenko, who was under investigation in Ukraine, has returned to Crimea, the Komsomolskaya Pravda Crimea newspaper reported, citing the captain. "There were no restrictions preventing me from going back home. I legally crossed the border using my Russian passport. I arrived in Kerch in the evening, when everybody was at home and they were all happy to see me. I just climbed the stairs and rang the doorbell. My daughters and wife were stunned, naturally," Gorbenko told the paper. A week ago, Ukraine’s Interior Ministry issued a nationwide alert for Vladimir Gorbenko who had broken contact with his Ukrainian lawyers on January 26.